"Surf the Internet with the highest protection while using Hotspot Shield." 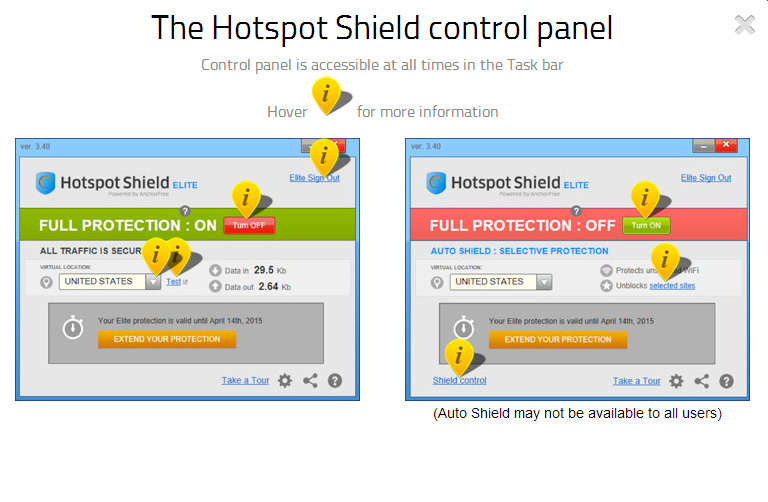 Hotspot Shield is a service to aid you in safely browsing the Internet. It connects through a virtual private network, or VPN, to maintain your anonymity while using the Internet. The application and uses an encoded connection of 128 bits that gives you a strong secure connection while you browse the Internet using your Internet browser or anything application that uses an Internet connection on your PC. Once Hotspot Shield is installed and connected, your Internet connection is sent and received through a safe bridge with anti malware protection for avoiding infections. Apart from that, your connection with the Hotspot Shield servers will make sure that that your IP stays protected and anonymous. As the servers are based in the USA, it is possible to access the online services which are not offered abroad. This can be useful for countries that has browsing limitations or cannot receive the services provided by media services from other countries. The servers in the United States usually have some of the most lenient restrictions, which can not benefit you when you use Hotspot Shield. You can use Hotspot Shield with all of the most commonly used Windows operating systems used today. This includes Windows XP, Windows Vista, Windows 7, and Windows 8 and 8.1. It is very easy to use and can be activated and deactivated by clicking on it's icon on the toolbar. This will change it's color from green to red depending on its state. For more information on how to do this, please refer to the "How to install" and "How to use" tutorials right below this review. 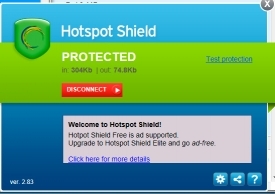 Hotspot is completely free to use with it's basic license, although there are some ads in the program which can be switched off by buying the Hotspot Shield Elite version for about 33 dollars USD. Recently, where there are restrictions of use outside certain countries, or even certain places where the online communications are not safe, the use of programs like Hotspot Shield is recommended for a safe and free browsing and if you want to use services that wouldn't otherwise be available in your country because of government limitations or services limitations. Learn how to install Hotspot Shield. 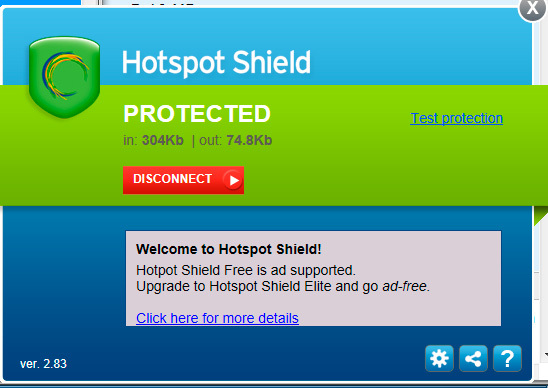 Learn how to use Hotspot Shield.